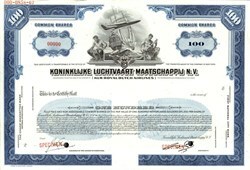 Beautifully engraved RARE specimen certificate from the Koninklijke Luchtvaart Maatschappij N. V. (KLM Airlines) printed in 1967. This historic document was printed by American Bank Note Company and has an ornate border around it with a vignette of two allegorical men, a ship, and a airplane. This item has the printed signatures of the Company's President and Secretary and is over 48 years old. KLM, legally Koninklijke Luchtvaart Maatschappij N.V. (Royal Dutch Airlines), is the flag carrier airline of the Netherlands. KLM is headquartered in Amstelveen, with its hub at nearby Amsterdam Airport Schiphol. It is part of the Air France�KLM group, and is a member of the SkyTeam airline alliance. KLM was founded in 1919; it is the oldest airline in the world still operating under its original name and had 32,505 employees as of 2013. KLM operates scheduled passenger and cargo services to approximately 130 destinations. Passenger aircraft are configured in a three-class layout, including business class, Economy Comfort, and economy class. KLM has a reputation as one of the world's safest airlines. Its frequent-flyer program is called Flying Blue, and has codeshare agreements with other airlines�both members and non-members of SkyTeam. The first KLM flight was on May 17, 1920, with a flight from Amsterdam to London carrying two English journalists and a number of newspapers. It was flown by an Aircraft Transport and Travel Airco de Havilland DH16, callsign G-EALU, piloted by Jerry Shaw. In 1921 KLM started regularly scheduled services. By 1926 they were offering flights to Amsterdam, Rotterdam, Brussels, Paris, London, Bremen, Copenhagen, and Malmo; using primarily Fokker F2 & F3. Intercontinental service to the Netherlands East Indies (the modern Republic of Indonesia) started in 1929 using Fokker F7-B, although the first non-scheduled KLM flight had been made in 1924 by Fokker F7 Callsign NACC piloted by van der Hoop. The first transatlantic KLM route was between Amsterdam and Cura�ao in December 1934 using the Fokker F-XVIII "Snip." On May 21, 1946, KLM launched scheduled service between Amsterdam and New York, while the first polar route was opened on the Amsterdam-Japan route on November 1, 1958. In March 1960, KLM introduced the first jet aircraft into the its fleet: the Douglas DC-8. Use of Schiphol began in April 1967, and the first Boeing 747 entered the KLM fleet in February 1971, beginning the era of widebody jets. In 1983, KLM reached a deal with Boeing to convert some of its Boeing 747-200s to SUD(stretched upper deck) configuration. This consisted of returning the aircraft to the Boeing factory in Everett,Washington. The work started in 1984 and finished in 1986,the aircraft finishing mostly as Boeing 747-300s, which the airline also operated. In June 1989, KLM introduced the first Boeing 747-400. Later that year, in July, KLM acquired 20% of Northwest Airlines, eventually forming a strong alliance between the two airlines. In March 1994 both KLM and Northwest Airlines introduced World Business Class on intercontinental routes, and in July 1995, KLM introduced its first Boeing 767-300ER. In March and June 2002, KLM announced that it would be renewing its intercontinental fleets by replacing the Boeing 767s, Boeing 747-300s, and eventually the McDonnell Douglas MD-11 with Boeing 777-200ERs and Airbus A330-200s. The first Boeing 777 was received on October 25, 2003, entering commercial service on the Amsterdam-New York route, while the first Airbus A330-200 was introduced on August 25, 2005 and entered commercial service on the Amsterdam-Washington Dulles route. History from Wikipeida and OldCompany.com.